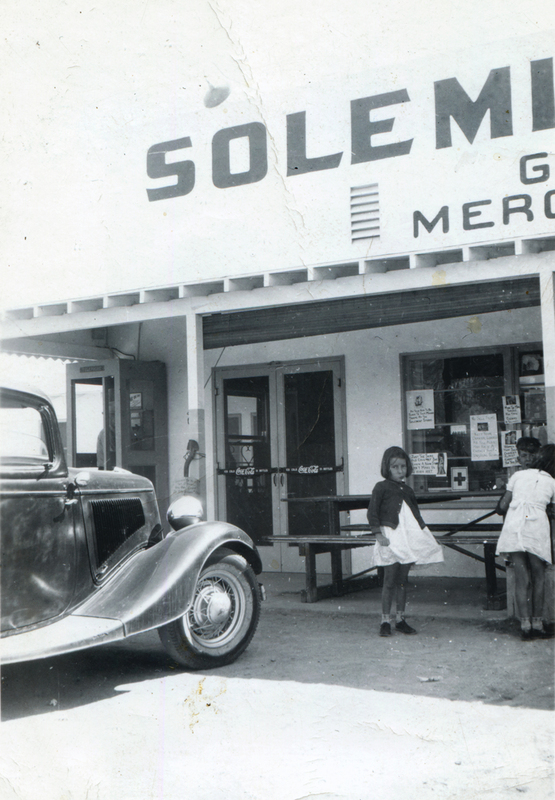 Alfred Clark opened the place in 1938 as a general store for ranching families in present-day Canyon Country, then called Saugus, and as a pit stop for travelers along the region's main arteries, namely Soledad Canyon Road and Mint Canyon Road (aka Sierra Highway). It's said Clark was able to get his hands on black-market goods such as black silk nylons, bubble gum, red meat and sugar during World War II. • "He told her to be sure to get mouse traps at the Solemint Store" (with indiscernible image). • "Just the same old country boy. Even a new store can't make us a high hat" (with image of baby in top hat). • "We sell films / Keep your camera loaded as you also may also have a chance for an unusual picture." • "Man to Man / Smoke Roi Tan Cigars at Solemint." Another sign at lower right, partially obscured by the boy's head, reads: "Women (?) that sold (?) carries everything for the (?)." Two full-width screen door handles advertise "Ice cold Coca-Cola in bottles." A man is using the pay phone at left; it has a fixed mouthpiece and presumably a separate receiver at the end of a cable. Around the end of the war, Clark sold the store to Harvey Hanson and "Ole" Olsen, who kept it going as a tourist trap with an adjoining restaurant. 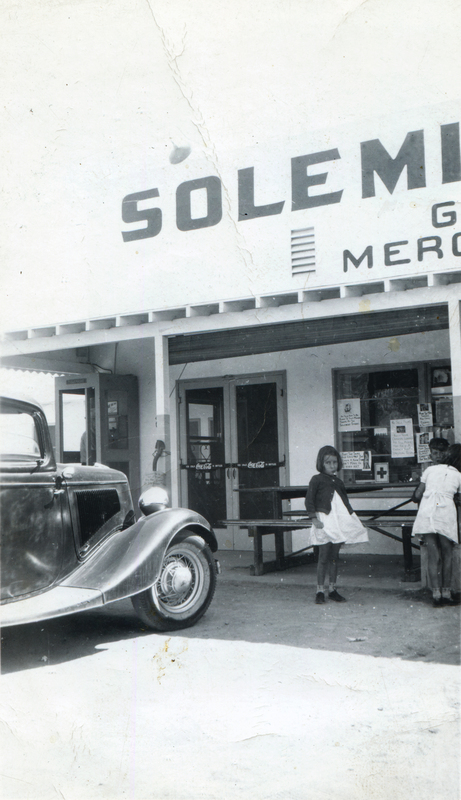 They operated it at the southeast corner of Sierra and Soledad for the next 20 years — until the Dillenbeck Canyon Market on the opposite corner took over as the community's preferred provider of groceries and sundries. LW2610: 19200 dpi jpeg from original 2½x4½-inch print.